Each month, we bring you a snapshot of Shakespeare in performance across America. What’s onstage this month? To find out, we checked in with our partners at the Annapolis Shakespeare Company, Chicago Shakespeare Theater, Oregon Shakespeare Festival, Seattle Shakespeare Company, and Theatre for a New Audience. Susanna Stahlmann and Matthew Greer in “Twelfth Night.” Photo by Evan Krape. 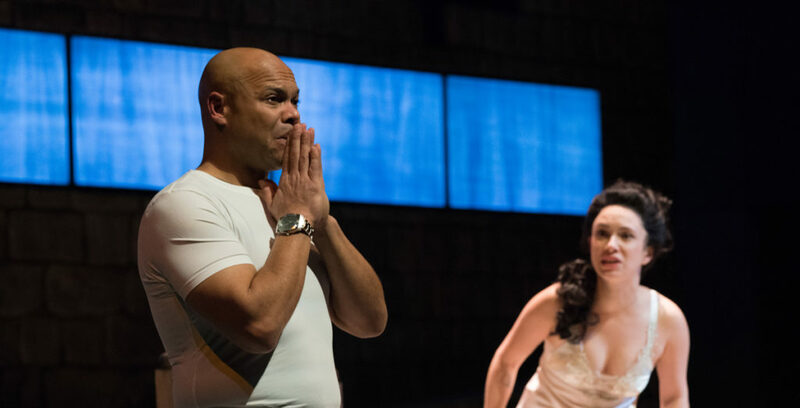 Theatre for a New Audience’s Polonsky Shakespeare Center hosts The Acting Company and The University of Delaware’s Resident Ensemble Players’ Twelfth Night (through May 27), directed by Tony nominee Maria Aitken (The 39 Steps). Desdemona (Alejandra Escalante) insists she’s been faithful and begs Othello (Chris Butler) to spare her life. Photo by Jenny Graham, Oregon Shakespeare Festival. It is Shakespeare’s most intimate tragedy… You know, the majority of the play is very intimate scenes between two, or at most three, people…Really digging into what’s going on between the major characters by distilling the cast down to the smallest possible number feels really important to me. 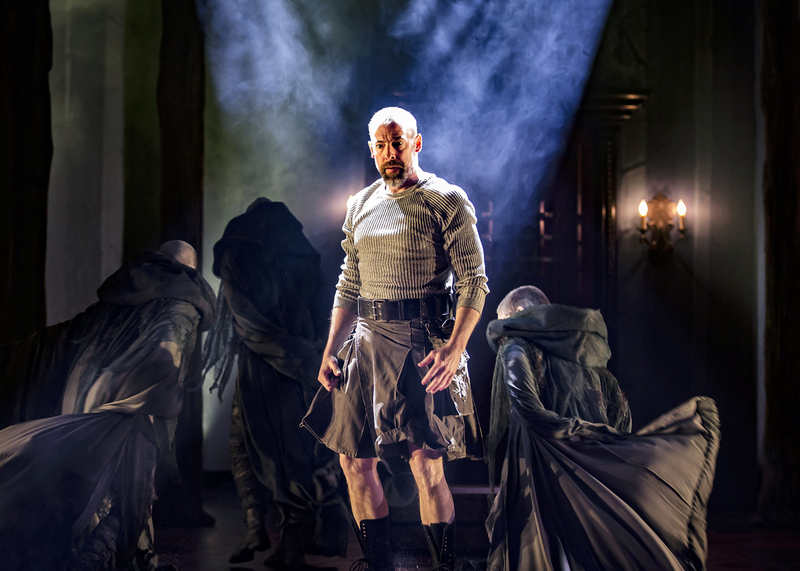 Macbeth (Ian Merrill Peakes) weighs the cost of his ambition, shadowed by the spirits of the Weird Sisters in Chicago Shakespeare Theater’s production of Macbeth, adapted and directed by Aaron Posner and Teller, in The Yard at Chicago Shakespeare, April 25–June 24, 2018. Photo by Liz Lauren. Macbeth continues until June 24 at Chicago Shakespeare Theater. The production, directed by Aaron Posner and Teller (of Penn & Teller), examines “what’s illusion and what’s real;” magic tricks devised by Teller “put the audience into the same emotional position that these characters are to their world.” Our good friend Ian Merrill Peakes stars as Macbeth—he’ll take the role on again this September here at the Folger in a music-infused, Restoration adaptation of the play. The Company of Annapolis Shakespeare Company’s “Kiss Me, Kate.” Photo by Joshua McKerrow. Benjamin Russell (Petruchio) and Robin Weiner (Kate) in Annapolis Shakespeare Company’s “Kiss Me, Kate.” Photo by Joshua McKerrow. The Company in “Too Darn Hot” in Annapolis Shakespeare Company’s “Kiss Me, Kate.” Photo by Joshua McKerrow. Looking for something Shakespeare-inspired? Check out two shows on opposite ends of the country. On the east coast, the Annapolis Shakespeare Company presents Cole Porter’s Kiss Me Kate, through June 3. The musical is about the backstage antics of an estranged couple who’ve been brought back together to play Kate and Petruchio in a production of The Taming of the Shrew. Has anyone ever told you to “Brush Up Your Shakespeare?” It’s a song from this famous musical. Rafael Jordan as Shakespeare in “Shakespeare in Love.” Photo by John Ulman. Chiara Motley and the cast of “Shakespeare in Love” Photo by John Ulman. “For Will, the creative world is all around him, except that he’s blocked and just not seeing it,” says [Artistic Director George] Mount. To create a physical representation of the words and ideas that Will draws inspiration from, costume pieces will literally have Shakespeare’s words and phrases written on them and the set will feature text from Shakespeare’s plays in its design. ⇒Related: Read Shakespeare & Beyond’s look at Shakespeare in Love. Shakespeare in Love is a part of Seattle Celebrates Shakespeare, a city-wide festival that brings together nearly 25 of Seattle’s theater, dance, music, and film companies in celebration of the Bard. The Annapolis Shakespeare Company, Chicago Shakespeare Theater, Oregon Shakespeare Festival, Seattle Shakespeare Company, and Theatre for a New Audience are theater partners of the Folger Shakespeare Library.